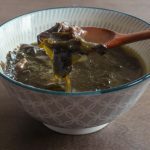 This recipe reminded me how much easier the Instant Pot can make my life! I spent all weekend around the kitchen because DrJuh was studying (last minute) for the boards which meant I tested out a bunch of recipes. 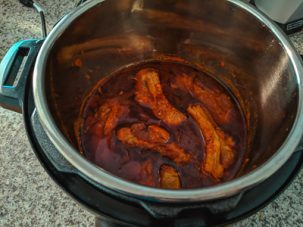 Tired on a Sunday night, I remembered the random pork ribs and our Instant Pot. The response to the recipe was “oooh, this is really good”. So, success! 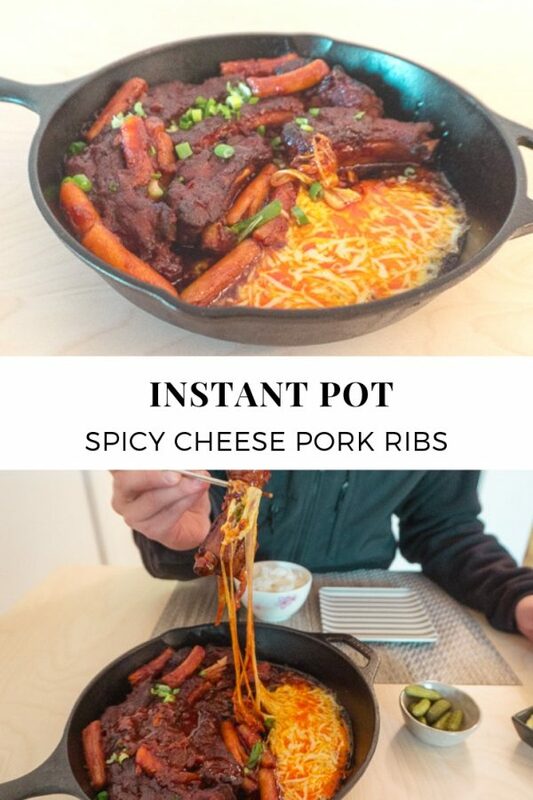 I took Baek Jong Won’s original spicy pork rib recipe that is cooked on the stove and adapted it for the Instant Pot by reducing the water and adjusting the cooking time. (I then proceeded to the gym for a quick cycle session while the Instant Pot did its magic). And then, I popped the ribs under the boiler for some deliciously tender smokey and spicy pork ribs. I always note that I’m not huge about cheese on spicy food so I left it to the side but this was actually really good! 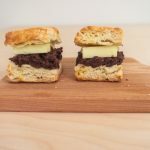 Dipping the ribs into the cheese made for a good fusion blend of spicy and creamy. 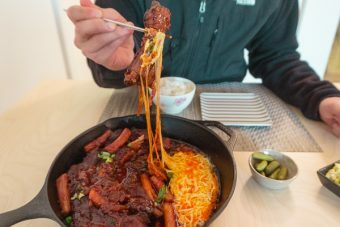 The pork ribs here look super spicy but I think it’s actually the right amount of heat that’s really balanced well with the cheese. DrJuh ate half of them with a bowl of rice and the other half of them with toasted buttered bread. Take your pick and enjoy! *It looks like a lot of steps but it’s really not!! I made this quick on a lazy sunday evening! 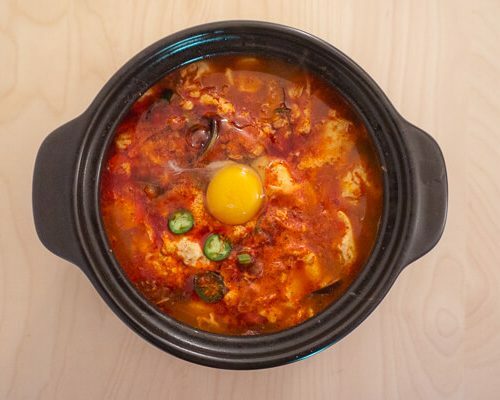 This recipe uses “go eun gochugaru” which is fine Korean chili powder. The fine version tends to be slightly spicier and blends in a bit more. 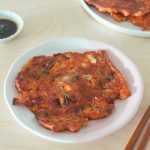 It’s the powder that is used to make gochujang and so is much finer. 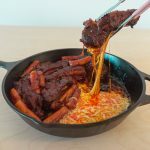 If you don’t have an instant pot, this recipe can definitely be made on the stove top in a braiser or deep frypan with lid. 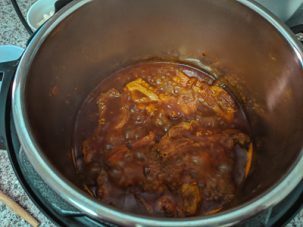 Instead of the 1 cup of water, add in about 3-4 and continue to cook on the stove on medium heat for about 40-50 minutes until the pork is tender. 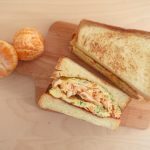 You will want to keep your eye on it occasionally but this is how Baek Jong Won made it originally! The photos are for about 2/3 of the amount written in the recipe. 1. If you bought a rack, remove the membrane from the underside of the ribs, pulling it down the entire length. Separate the ribs by cutting the meat between the bones. *I prefer to buy the back back ribs that are already separated to make it easier. 2. 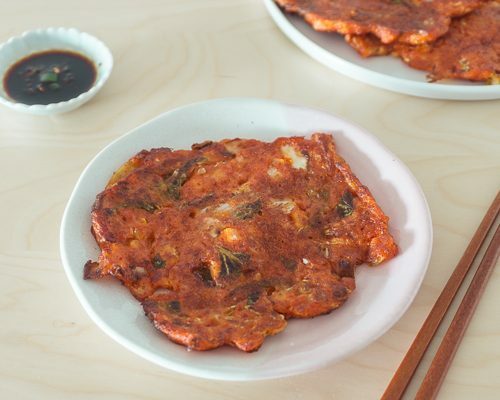 Parboil the pork to get rid of any of the meaty odors (often done in Korean meat dishes). Bring a large pot of water to a boil. Once it is boiling, add in the pork ribs and the mirin. Continue to simmer for about 8 minutes with the lid off. 3. Drain the water and wash the ribs under cold running water. 4. 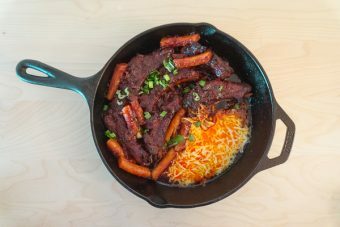 Place the clean ribs in the instant pot. Top the pork with the sliced onions. 5. Add in all of the sauce ingredients into the instant pot including the water. 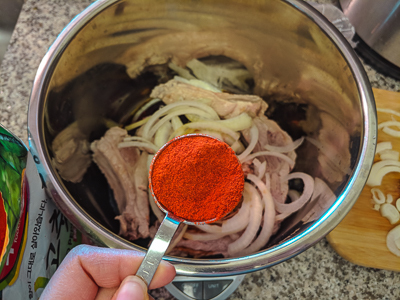 Mix around the sauce in the pot and spoon it over the pork and onions a few times. 6. Close the lid and pressure cook on high! I found that 19 minutes was perfect (random minute). It was tender with slight chew. You can do about 16 minutes if you want it chewier or up to about 24 minutes for it to be fall of the bone. When done, natural release for about 5 minutes or fully. 7. Open the lid and turn the Instant Pot on to “saute”. This will continue to make the pot simmer and cook. Add in the rice cakes. Simmer until there is only about 1 cup of sauce left or once the sauce looks very thick. *In the meantime, heat your oven to broil. 8. Move the pork to a cast iron or oven friendly dish. 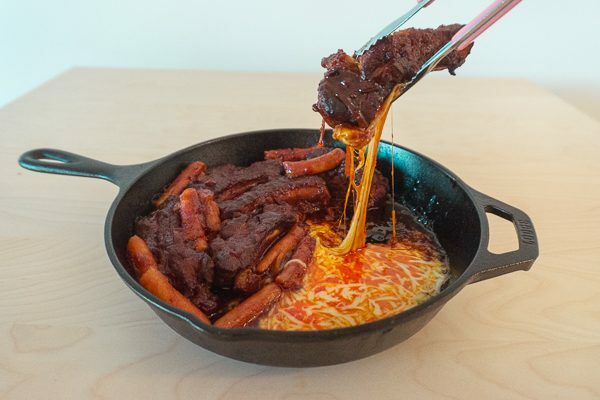 Brush or pour more of the sauce on top of the pork. *Optional, you can save about ½ cup of the sauce to dip if you want. The pork will already be somewhat salty though! 9. In a small bowl, mix the cheese and heavy cream together, set aside. Broil the pork dish about 4-6 minutes on one side. Flip the pork over and broil for about 3 minutes. Take the pork dish out, pour the cheese on to one side of the dish. Place back into the broiler for about 2-3 more minutes until the cheese has melted. 10. The pork ribs are now ready to serve! Sprinkle the scallions. 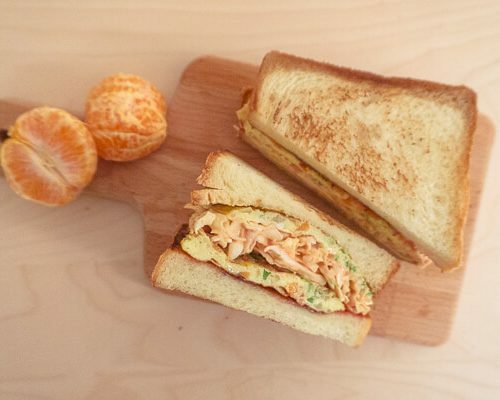 Enjoy with a warm bowl of rice or with toasted bread. Whatever you decide! 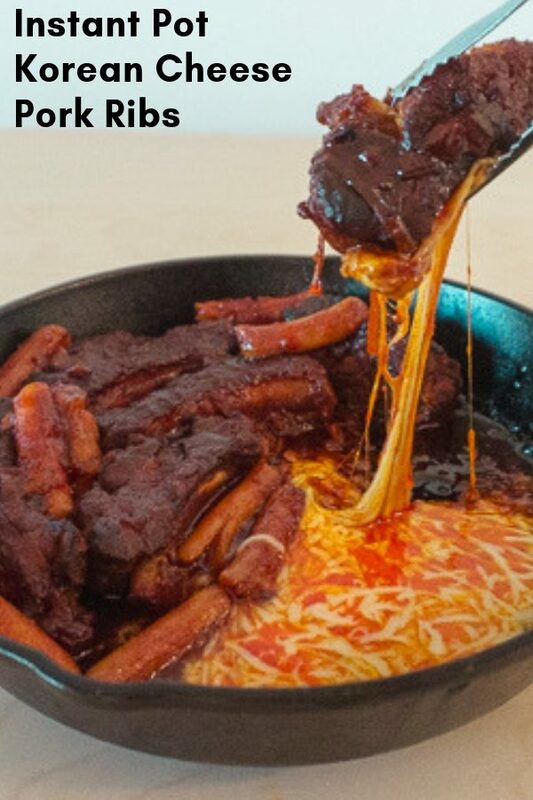 Spicy saucy Korean pork ribs that's perfectly balanced by melted cheese. 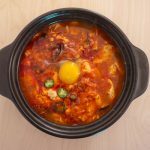 Made easy through an Instant Pot and famous chef Baek Jong Won! 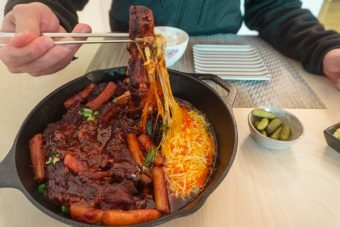 Parboil the pork to get rid of any of the meaty odors (often done in Korean meat dishes). Bring a large pot of water to a boil. Once it is boiling, add in the pork ribs and the mirin. Continue to simmer for about 8 minutes with the lid off. Drain the water and wash the ribs under cold running water. 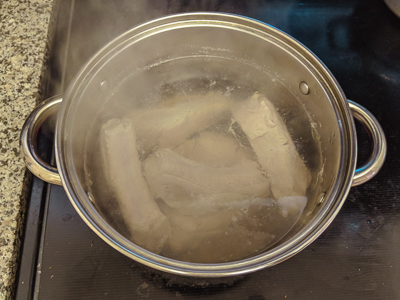 Place the clean ribs in the instant pot. Top the pork with the sliced onions. Add in all of the sauce ingredients into the instant pot including the water. 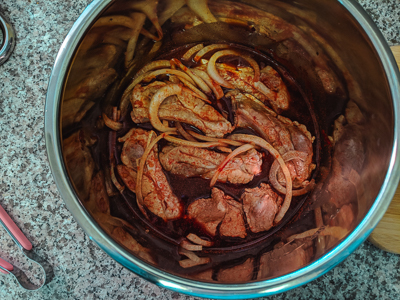 Mix around the sauce in the pot and spoon it over the pork and onions a few times. Close the lid and pressure cook on high! I found that 19 minutes was perfect (random minute). 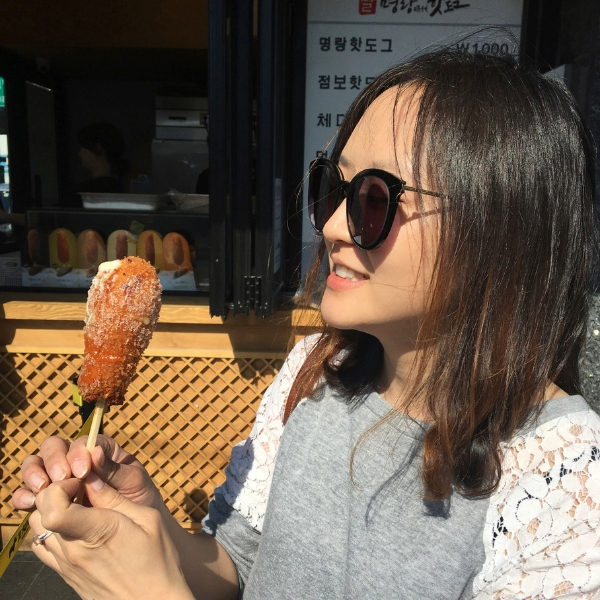 It was tender with slight chew. **You can do about 16 minutes if you want it chewier or up to about 24 minutes for it to be fall of the bone. When done, natural release for about 5 minutes or fully. Open the lid and turn the Instant Pot on to “saute”. This will continue to make the pot simmer and cook. Add in the rice cakes. Simmer until there is only about 1 cup of sauce left or once the sauce looks very thick. Move the pork to a cast iron or oven friendly dish. Brush or pour more of the sauce on top of the pork. **Optional, you can save about ½ cup of the sauce to dip if you want. The pork will already be somewhat salty though but some like it even saltier! In a small bowl, mix the cheese and heavy cream together, set aside. Broil the pork dish about 4-6 minutes on one side. Flip the pork over and broil for about 3 minutes. Take the pork dish out, pour the cheese on to one side of the dish. Place back into the broiler for about 2-3 minutes until the cheese has melted. 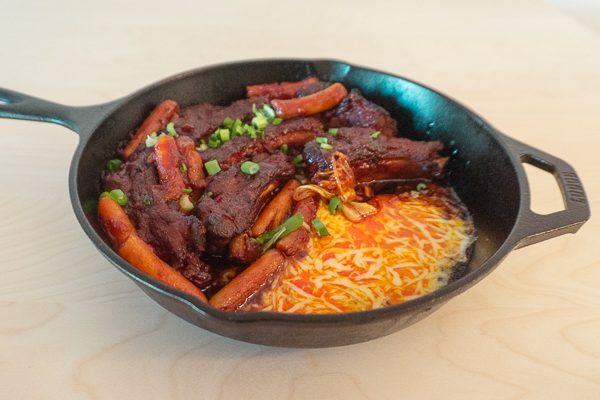 The pork ribs are now ready to serve! Sprinkle the scallions. Enjoy with a warm bowl of rice or with toasted bread. Whatever you decide!